The sides of the pedestal of Franklin's statue in Waterloo Place, London, list the names of the full complement of the expedition's lost, cast in bronze. To produce what I hope is a definitive list, I have combined the names from the plaques with my own transcriptions of the muster books of Erebus and Terror in the National Archives. Name Qualities Age Birthplace List No. The final two columns, "List" and "No. ", refer to the individual lists within the muster books and the number of each man within them. The titles of the lists referred to above are shown in the following table. Andrew Lambert notes that "In February 1914 the Board of Works corrected the spelling of des Voeux's name from des Vauex, and changed le Vesconte's middle initial from F to T in 1931, at £2 a time. Then the Board checked the Admiralty record to ensure there were no more errors." I have to take issue with the Board of Works in two cases, Alexander Paterson of HMS Erebus, and Able Seaman John Bates of HMS Terror, who gain a "t" and lose an "s", respectively, on the plaques. Even the legendary Richard Cyriax was not immune to error. His transcription of the muster lists spells the surname of William Clossan as "Closson" and renames Sergeant Daniel Bryant as David. In the light of the above, I can make no claims for perfection, but hope that this is an improvement on previous compilations. Thanks for this, Peter. I might however mention that the domestic ratings were unclassed at this time, and were not petty officers. Thanks Peter, this is a fabulous resource! By domestic ratings, Glenn, do you mean the stewards? Thanks for the kind comments, both. The categories are as they appear on the bronze plaques. Perhaps we can think of the stewards receiving a postumous promotion when the monument was unveiled in 1866. Perhaps a third source would be the periodic Admiralty List books, listing of officers and , perhaps crew. I looked at the early 1850s version. Before the ships were declared lost for good, several of the officers had been promoted after the expedition started. I'm a little late with praise, but I have to mention just how often I've used this resource over the past month or so. Thanks for the hard work in compiling it, Peter! Great list! 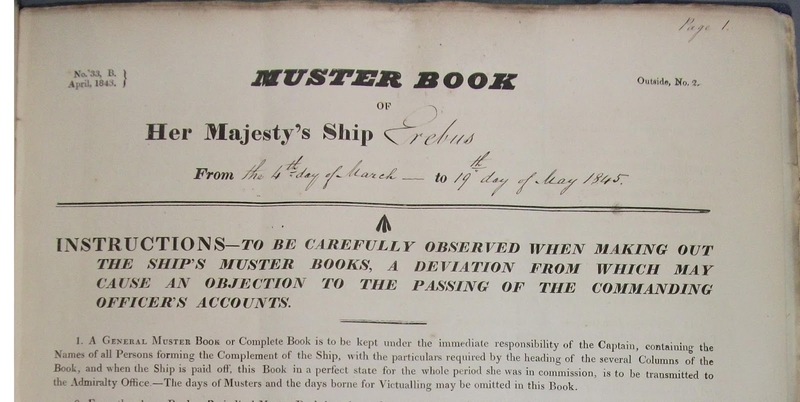 One question if I can: there is missing "Thomas Burt, Armorer, age 22" among petty officers at Erebus, see http://www.ric.edu/faculty/rpotter/muster.html and http://franklinsghost.blogspot.cz/2009/06/muster.html . Is he missing at the pedestal? I reply youself (I hurried too much to ask). Thomas Burt was sent home from Greenland. Somehow he managed to get to the lists of Erebus crew instead of James Hart (leading stoker is missing in some of these lists). 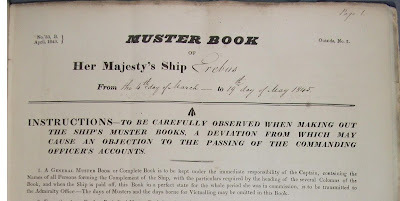 Is there more information on each individual in the muster books then what is listed here? Hi Peter I see that Marine Joseph Healey on the Erebus as listed in Manchester would you know his address Iv'e found that he come from Middelton but I'm unable to find the street etc. My father and I have taken a keen interest in your blog since discovering (only this week through Ancestry.com) that Thomas Armitage (one of the petty officers on board the Terror) is our fourth and fifth times grandfather. We are making contact to see if anything else is known about him and the rest of the crew and to thank you this wonderful blog which has got us so excited about continuing our research. I stand corrected by dad - Thomas must be my great great great grandfather. My ancestor Able Seaman David Sims on HMS Terror was only "known as" David by his family and obviously signed up under that name and is recorded on ALL named memorials under this name and on muster rolls. He was actually baptised and recorded in death on his Will as HENRY JEREMIAH SIMS otherwise DAVID. No one is aware of this information! the memorial at Gravesend records him at DAVID TIMS which is totally incorrect! I know this is probably a long shot and it's an old post but would anyone want to hazard a guess as to why William Bell (quartermaster on Erebus) is listed as being from "Dundee, Forfar", as these are two separate towns in Scotland which are about half an hour's drive (by modern transport) from each other? Found it a bit curious, as both are in the same county of Angus.